- Beat egg whites in large bowl with electric mixer at medium speed until foamy add 3-4 drop red food coloring, gradually add 3 Tbsp granulated sugar,beating at high speed about 2 minutes or until mixture foam stiff,shiny peaks. Then work in the mixture (macaronage ) using plastic scraper, press down well with the scraper,going back and forward,to press out the oxygen from the white,Do this for 2-3 minutes until you have smooth mixture. - attach 1/2 inch plain tip to piping bag,scoop batter into bag pipe 1-inch circles about 2-inch apart onto prepare cookie sheets,tap cookies sheet on flat surface to remove air bubbles and set aside,let macarons rest uncovered,until tops harden slightly,this takes from 15 minutes to an hour in more humid condition,when the batter does not stick,macarons are ready to bake. 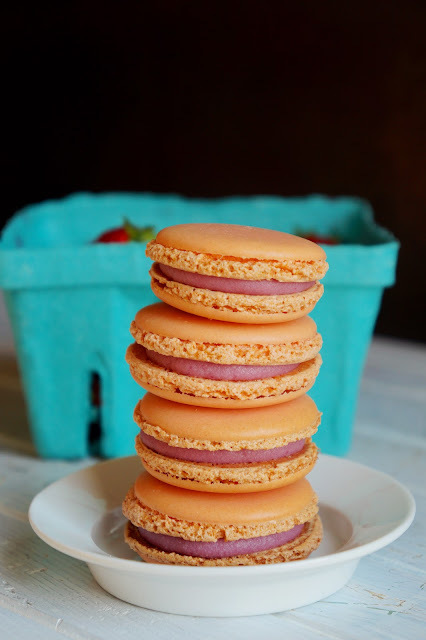 - For macarons filling, in a mixer mix room temperatur mascarpone cheese,powder sugar and strawberry or blueberry jam until smooth transfer into piping bag with match same size cookies,pipe or spread filling on flat side of one cookie and top with another. Talk about the perfect macarons! Well done!